There were six different 5 1/2" Two-in-One figures which were much like (and the predecessors of) the Transformers line that came out years later. These were Dangard, Daimos, Gaiking, Grandizer, Raydeen and Voltus V. These toys epitomize Chogokin as we know them in the US. The most common appear to be Raydeen, Dangard and Daimos, with Gaiking, Voltus V and Grandizer following in order or rarity (this has been my experience and may reflect availability in the Atlanta, Georgia area...where I reside). 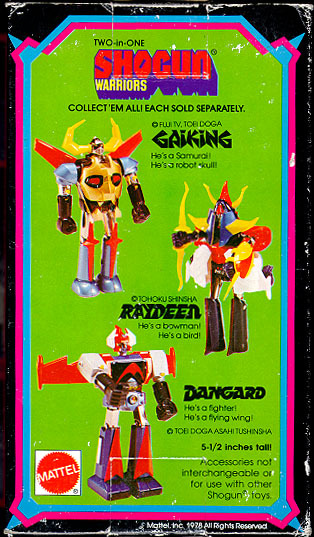 I believe that there were two separate releases of the Two-in-Ones: The first being Gaiking, Raydeen and Dangard (these three share an instruction sheet and have pictures of all three on the box back; also, these three all have the box flap attached to the front edge of the box); The second release appears to have added Daimos, Grandizer and Voltus V (these three did not come with instructions and have the box flap attached to the back edge of the box). Of course, this is speculation and unconfirmed. Daimos was given the new "safety" missiles at some point. 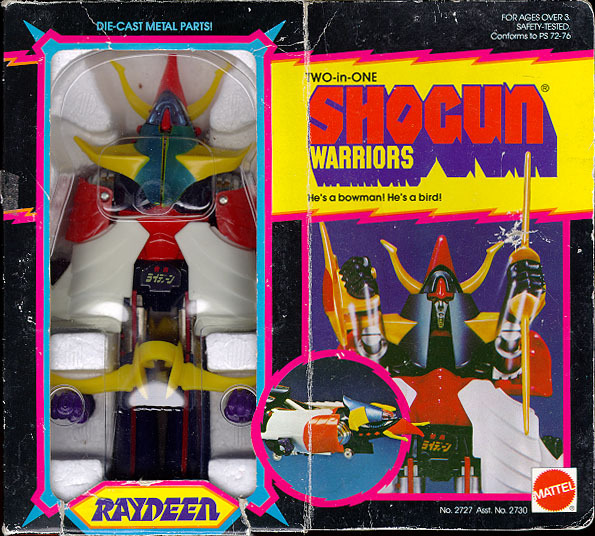 Raydeen is one of the more common Two-in-One Shoguns, but is often missing a fist, bow or shield. Raydeen could transform from a giant robot into a bird-like plane. The carries a shield and bow as weapons when a giant robot. The box reads: "Die-cast Metal Parts!" "He's a bowman! He's a bird!" "Turn him into a bird!" "Launch his bow & shield!" "Rotate his arms!" "Make him roll on wheels!" "Push Buttons! Launch Fists" and "Bend his legs!" Gaiking is one of the most desirable of the Two-in-Ones and is pretty tough to find boxed or loose. The figure launches both fists and can hold its shin guards as weapons. 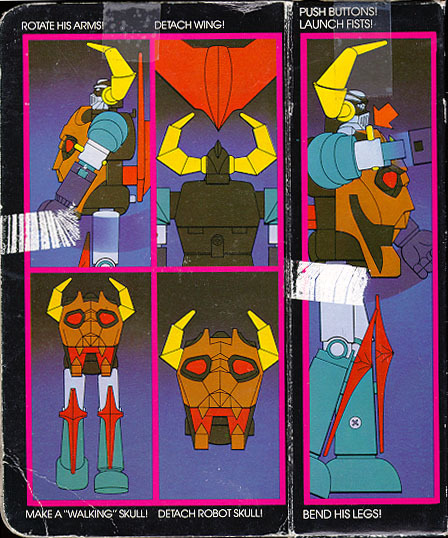 The unique transforming ability allows the robot to bcome a horned skull (The arms and legs come off, the head retracts into the body and the horns project out of the arm holes). The box reads..."Die-cast Metal Parts!" "He's a Samurai! He's a robot skull!!" "Rotate his arms!" "Detach wing!" "Make a "Walking" Skull!" "Detach robot skull!" "Push Buttons! Launch Fists!" and finally "Bend his Legs!" 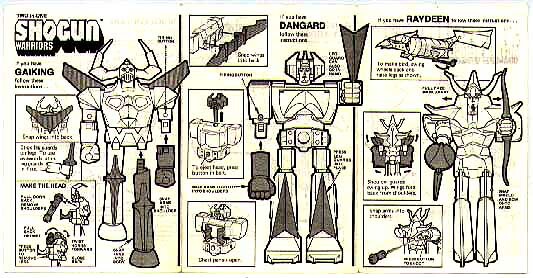 Dangard (really Dangard Ace but shortened for the Shogun Warrior toy line) is one of my favorite Two-in-Ones. Both his arms and his head shoots off. 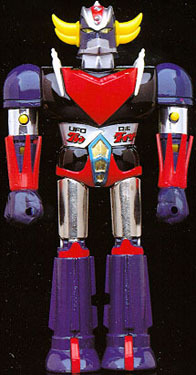 Also, his shin guards may be held as weapons and his chest opens to reveal his mechanical interior. His giant Para-wing propels him through the air and space. The box reads..."Die-cast Metal Parts!" "He's a fighter! He's flying wing!" "Launch his head!" "Open his chest!" "Detach his wing!" "Rotate his arms!" "Push Buttons! Launch Fists!" and finally "Bend his Legs!" The ST version of Daimos doesn't do a whole lot when compared to the DX (the DX actually transforms from a truck to a robot). 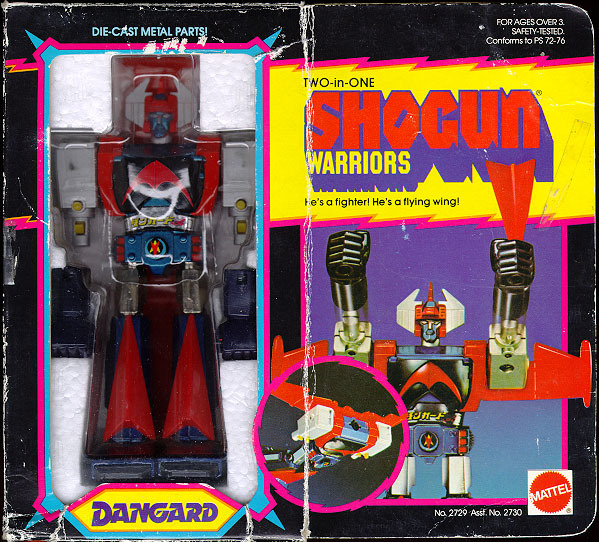 The Shogun Warrior version lacks some of the detail of the Japanese ST version, but still has leg cannons that fire missiles. The yellow chest piece is actually the handle of the double bladed sword. Both his fists fire off. 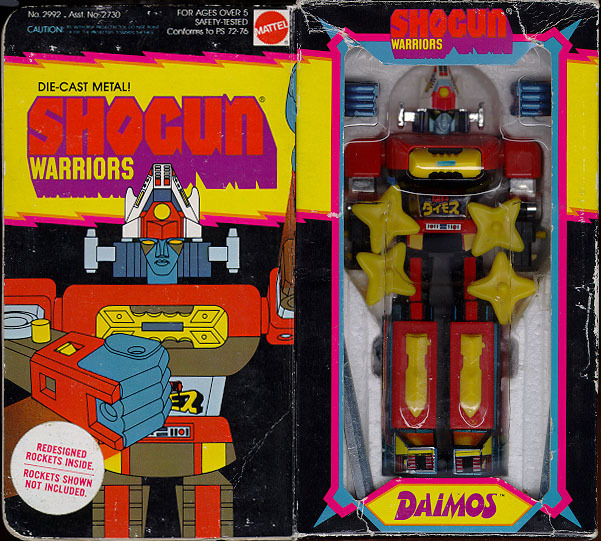 There are two versions of the Shogun Daimos, the first comes with small yellow missiles while the second comes with the redesigned "safety" missiles. 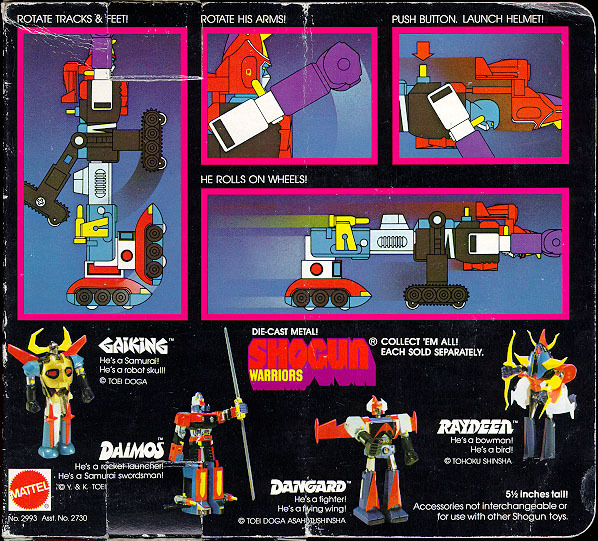 Pictured at left is the second version (there are also two different versions of the Daimos Truck Shogun Vehicle with the same difference in missiles). The box front reads: "Die-cast Metal!" "He's a rocket launcher!" He's a Samurai swordsman!" "See back for instructions." The box back reads: "Rotate his arms!" "Open leg hatches & launch rockets!" "Detach sword hilt!" "Fit hilt over fist" "Add Samurai blades!" 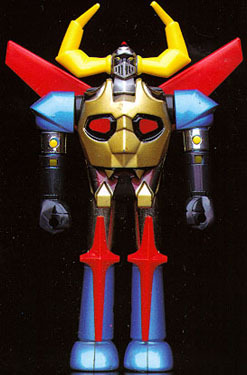 One of the cooler Two-in-Ones, Voltus fully transforms into battle-tank mode. His fists shoot off as does his helmet (the example pictured is missing the helmet...anyone out there with an extra or an incomplete figure for sale/trade?). The box reads: "He's a helmeted blockbuster! He's a rolling battlewagon! See back for instructions!"... "Rotate tracks & feet!" "Rotate his arms!" n"Push button. Launch helmet!" "He rolls on wheels!" I don't currently own a Grandizer Two-in-One but I've included pics of the GA-37 figure that I own (Deluxe figure with UFO). There are supposed to be some variations in the figure but I don's exactly know what they are. The GA-37 figure has firing fists, removable "sickles" that may be held and a backward hinged neck (for insertion into the UFO saucer). 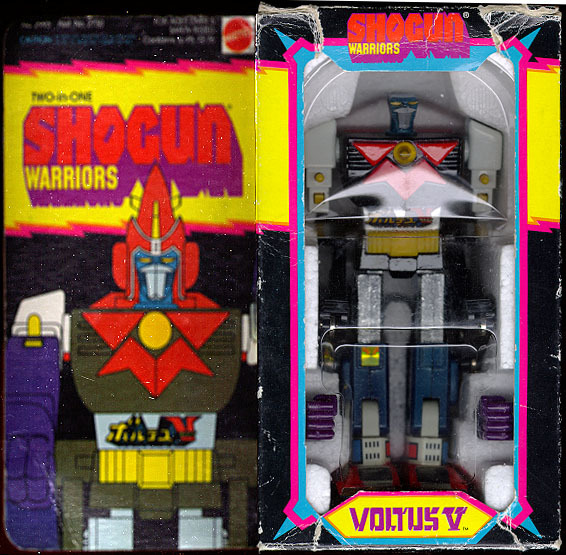 I believe that the Shogun Warriors version has a slightly different paint job and a different waist decal. 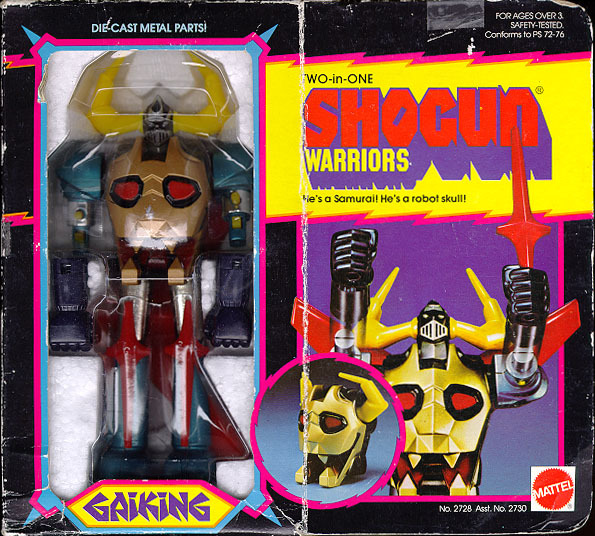 Also, the Shogun Warrior version may not have a hinged neck. 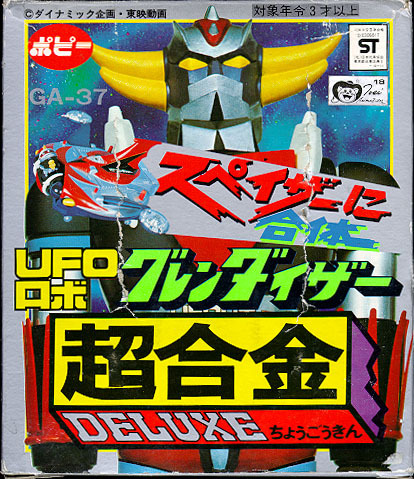 The GA-37 Deluxe UFO with figure was released in Europe under the Mattel Shogun Warrior line...I'm currently looking for one to add to my collection.